Introducing Summer Survival Book Bonanza Giveaways! It’s a Disaster and What are YOU Going to Do About it? This summer I’ve teamed up with a few other authors and bloggers to bring you a survival book bonanza! Each week there will be a new book to give to one of you, my lucky readers! This week, the book is It’s a Disaster . . . and what are YOU gonna do about it? If you have not had the opportunity to get your hands on this valuable resource guide, I highly recommend that you do! 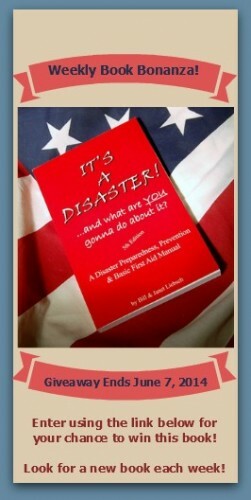 It’s a Disaster…and what are YOU gonna do about it? has been used in First Responder Training across the country! How much better could your family be prepared than to have at hand the very same book that so many First Responders use! The book doesn’t read like a novel nor is it difficult to ‘get through.’ In fact, it lends itself to reading in short segments of time based upon your need, area of potential disaster or interest. Even if you are in the midst of a crisis, the way this book is set up – it’s so easy to find what you need in just seconds that it is a far better field guide than most other emergency manuals I’ve read. From Family to Business preparedness or Natural to man-made disasters It’s a Disaster…and what are YOU gonna do about it? really covers the widest base of events I’ve ever seen in one book. Not only does it cover the event – it gives you the wherewithal to handle living through them! The step-by-step bullet points that help you stay on track for so many possible events help you feel ready with almost endless contingency plans. Enter this Weekly Book Bonanza Giveaway #1 for your opportunity to win it and add it to your bug out bag, emergency bin or back pack. COMMENTS on this blog are moderated and I will be away from my computer a lot of this week, so there may be a SUBSTANTIAL delay in your comment appearing on the site this week, but if you leave one I’ll get it! This would be great to teach others how to store freshly canned foods! Thanks! You can never have too many books on preparedness. Hope I win. Thank you. I think it’d be really cool to win this. It looks fantastic! do NOT use facebook so will NOT be able to get the extra enteries. 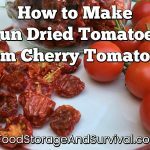 Received an email from Food Storage & Survival. Looks like it will be a great resource to have on hand & refer to often.